A question many will have before submitting a Reconsideration Request is whether they have cleaned up enough to have their request approved. Although there is no set number or percentage of backlinks that must be removed, Google is looking to see that you have removed a significant number of those backlinks that resulted in the penalty. I have seen articles that say at least 20% is average however, it will vary from case to case. I reviewed one case where the initial Link Research Tool report indicated that almost 45% of the total backlinks were considered toxic. You must make the final decision on how much is enough. But remember, if Google does not agree, they will simply not remove the penalty. They’ll advise you there are still too many unnatural backlinking and you then have to start the whole process over again. My advice is simple, if in doubt about a link, err on the side of caution and remove it. Now that you have finished notifying all of your email contacts, follow-up emails and any Disavow Lists, it is time to begin putting together your Reconsideration Request. Take your time in putting together your request because it will be reviewed by people, not a computer algorithm. You should provide as much information as you can to make their decision easier. Be honest and admit that any previous actions that u were taken that may have caused the penalty will not happen again. If the fault for the problem was caused by a previous SEO person, include that, however, if it was due to your work admit that. These items should be placed in a file on Google Docs, make them public viewable and provide links to Google in your Reconsideration Request, so the review team can easily check what you have done. Prior to submitting your Reconsideration Request make sure that you have uploaded your Disavow file and that it has been received. You will also mention your Disavow file in your reconsideration request with details on when it was submitted. You should include a statement that you are serious about complying with Google Webmaster Tools and are committed to following them in the future. 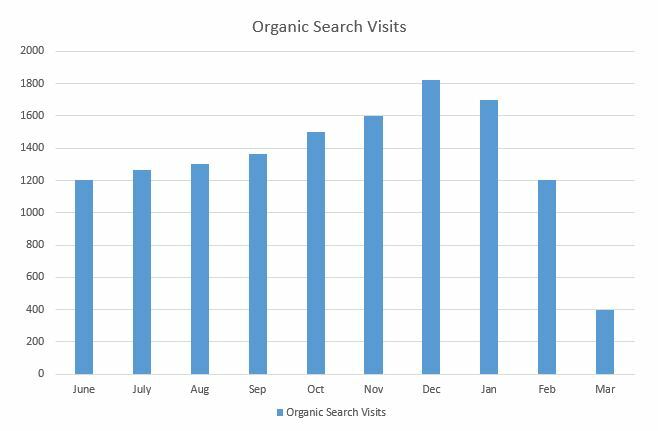 A good example of a Reconsideration Request can be found in Search Engine Watch’s article. Google will now remove the manual penalty and you should see your site start to return in search engine rankings, however, do not expect it to return to the same level it was before the penalty. 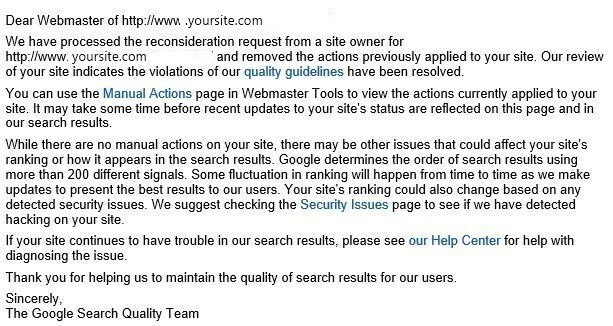 It is now time to begin work on improving your ranking through those actions within Google Webmaster Guidelines. If your request is not approved it is time to go back and take a closer look at those backlinks which you did not remove or change and do some more work! One final word about link removal. If you are the recipient of a request for a link removal, remove it! Do not be concerned about whether you think your website is quality or not. The only thing that really matters is whether the person requesting removal feels it is quality. Do not argue, do not get upset, just remove the link and notify them when it is done. In all probability, they have received a Google penalty and are going through the painful process you just finished so be helpful and remove the links. Good luck with your Reconsideration Request and feel free to comment or share this article. If you have been the victim of a Google manual penalty and need assistance in getting it removed give us a call. We will conduct an audit of your backlink profile at no cost and provide you with a report of what we found and the cost for us to do the work for you.